We are a specialist manufacturer of composites. 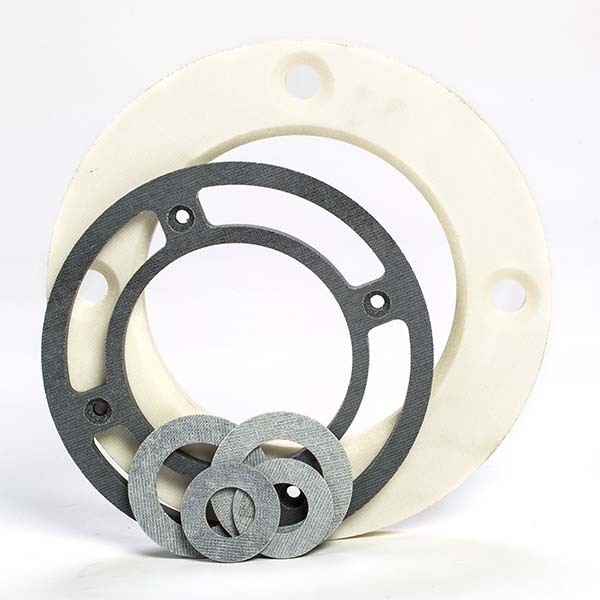 We supply our Tufcot® material as machined products such as spherical bearings, bushings, wear pads, laminates, hydraulic wear rings, semi-finished products and raw materials (tubes, rods, sheets). Contact our offices directly to discuss your requirements. 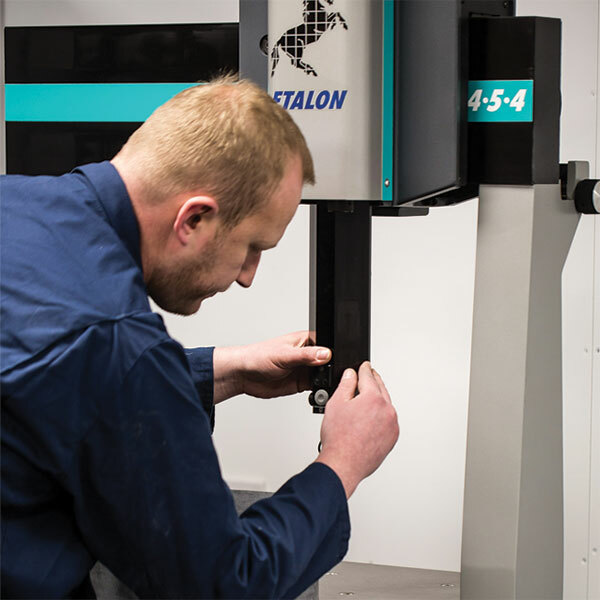 Specialists in the manufacture and machining of composites. 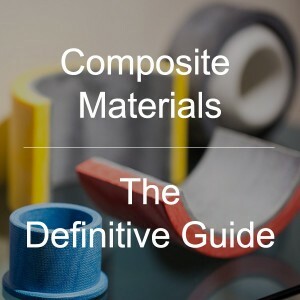 The company was founded in 1981 by 3 directors who, at that time, had a combined experience of over 40 years in the plastics and composite bearings field. The company has expanded and recently moved to significantly larger premises and currently employs over 40 people. The management believe that in order to continue this success they need to remain focused on supplying the customer with a first-class product, underpinned by a first-class service. 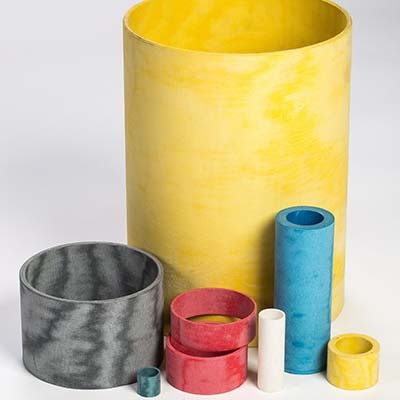 Tufcot is a composite engineering material manufactured from synthetic fibers and thermosetting resins. The physical and mechanical properties of Tufcot make it an excellent bearing material. 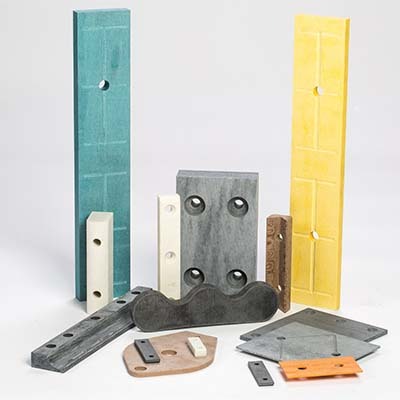 By varying the fabric reinforcement and the resin used, the physical and chemical properties of the material can be adjusted to suit a wide range of applications. Tufcot is highly recommended for use where other forms of lubricant are either not desirable or are erratic, intermittent or non-existent. What Makes Tufcot® So Efficient? How Can Tufcot® Help Your Engineering Processes? Tufcot is highly recommended for use where lubricants are undesirable, erratic, intermittent or non-existent. Where the maintenance of lubricant films is difficult, Tufcot has been found to give improved performance. The grade T100, in particular, has an extremely low rate of moisture absorption and therefore negligible dimensional change, making it ideally suitable for use in submerged water applications. Tufcot is only one-sixth the weight of steel, is easily machined, contains no harmful or toxic materials and has exceptional dimensional stability, even in wet conditions. It offers the design engineer an attractive alternative for bushings, bearings, wear pads and many more applications. Lloyds Approved Rudder Bearings, Lloyds Approved Pintle Rudder Bearings, Hatch Cover Pads, Stern Tube Bearings, Stabilizer Bearings, Deck Machinery Bearings. Wear Sheaves, Coal Cutting Machinery, Cable Guide Rollers, Pulley Blocks, Anchor Sheave Bearings, Fulcrum Bearings, Piston Rings for Hydraulic Pit Props, Conveyor Rollers, Gears, Rig Bushes. Locomotive Brake Gear Pads, Drawback Guides, Swing Link Seats. These grades are ideal for extreme cold conditions. There are many examples of Tufcot in use on railroad systems operating in extreme temperatures. Hydraulic Cylinder Wear Rings, Front Cover Bushes, Neck Bushes, Gland Bushes, Split Piston Bushes. Prevents metal-to-metal contact between piston/rod and bore/gland, absorbing high transverse loads. It is capable of withstanding high side loads, damping vibrations and embedded foreign particles. Higher static loads are permissible. Special materials are available with operating temperatures up to +392°F (+200°C). T100 White Water, Oil Dimensionally stable bearing material for the use primarily in harmless fluids. T100G Dark Grey Replace existing metallic or non-metallic bearing materials. Self lubricating version of T100. An inexpensive general purpose hard wearing material. Tufcot’s standard grade. Tufcot also produces T100GX with extra graphite. T100M Light Grey Replace existing metallic or non-metallic bearing materials. Self lubricating high performance bearing material. T100MP Light Grey Replace existing metallic or non-metallic bearing materials in the marine sector. Self lubricating high performance bearing material with low friction. Tufcot’s marine grade. T200P Brown High slip properties means it is suitable for Wear Pad or Press Slide arm applications. High slip properties. This is applicable for enhanced temperature applications. T400G Light Grey This grade is suitable for underground mining applications and anywhere with the potential for fire. Tufcot’s 400 range of resin is for fire retardance but is still self lubricating. T600G Dark Grey This grade is suitable for sewage, acid pickling baths and acid vapour environments. Tufcot’s 600 range is a superior chemical resistance grade at lower temperatures than T200G. 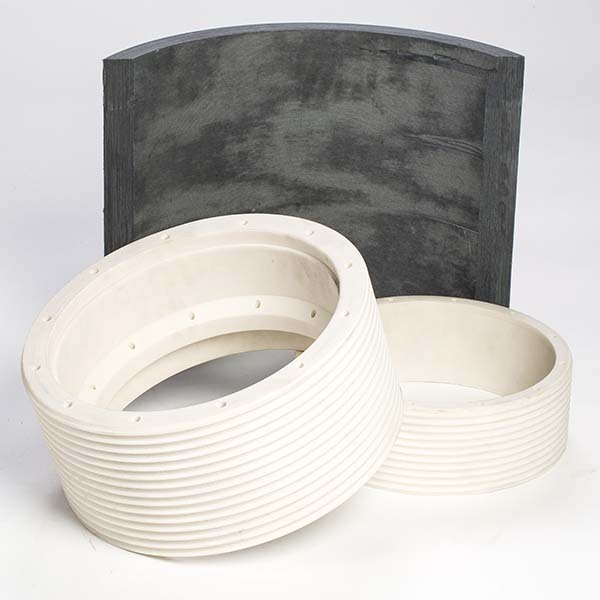 T100XPL Grey/To Order For use in high slip applications for example Wear Pads. Special PTFE layer incorporated in wearing surface which creates a very low co-efficient of friction. T600 To order Superior chemical resistance. Tufcot offers a wide range of machined products including bushings, sphericals, washers, wear strip, wear pads, wear rings and customized parts. Tufcot bushes are fabric composite materials of fine-weave plastic fabrics impregnated with special thermo-setting polyester resins. In order to improve their mechanical properties—in particular the friction coefficient—the resin is mixed with additives. Due to the wide range of materials with different mechanical and chemical properties, they are applicable to a large number of specific applications. Tufcot flanged bearing bushings are often used, and are ideal for, machined housings which are not set up to accept a regular bearing. Flanged bushes can be used in automotive, agricultural and industrial applications due to their long life-span and low maintenance requirements. Flanged bushes can be impregnated with several lubricants as can be seen on our material grades page. Tufcot Composite spherical bearings can be produced for both inner and outer housings. Inner rings can be split before and after machining. Sphericals are produced from our maintenance-free materials and are suitable for mounting in the housings. Sphericals can also be drilled and grooved if extra oil lubrication is needed. These are ideal for marine applications as they are saltwater proof. We can produce these in many sizes from 20 mm OD to larger, 400 mm OD as standard. Larger sizes may be available on request. 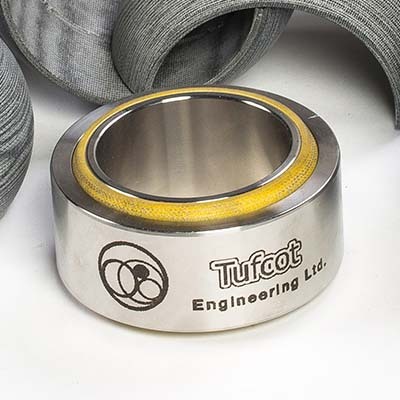 Tufcot thrust washers are dry-sliding thrust bearings produced from sheet material. These can be used for axially compact bearing locations where oscillating and rotational movement can occur. They are maintenance free which can prevent lubrication starvation occurring in places where lubrication is difficult to apply. 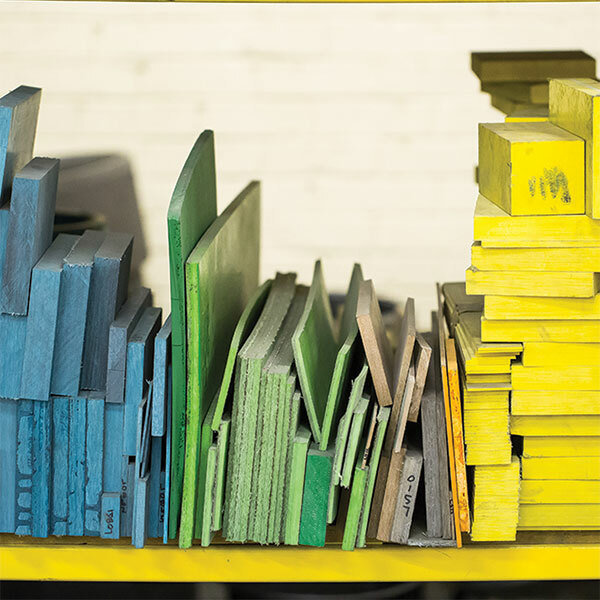 We can supply in many sizes and thicknesses throughout our whole range of material grades. 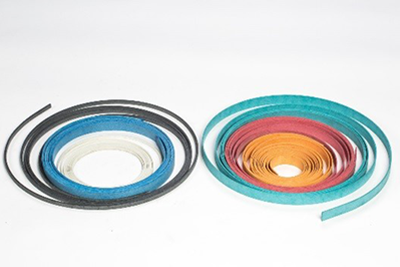 Tufcot standard wear ring or wear strip can be supplied from 1 mm to 5+ mm in thickness and widths of up to 50 mm. We can produce strip lengths up to 5 meters in length. 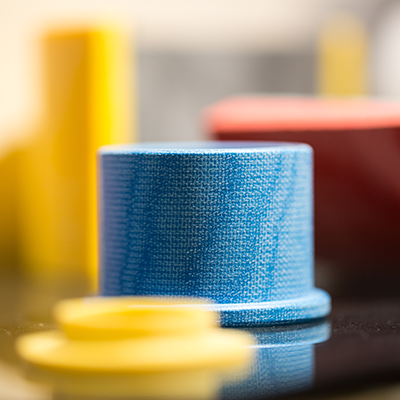 Our strips are machined to controlled and accurate tolerances and can be produced in various colors and grades. Tufcot strip allows for low slip characteristics and possesses excellent use in non-standard chemical applications with low swell. Tufcot stock strip is ideal for breakdown repairs. Tufcot wear pads are used in slide bearings, conveyor guides, scrapers and friction plates. Wear pads are predominantly used in the Textiles, Food, Railroad and Marine Industries. 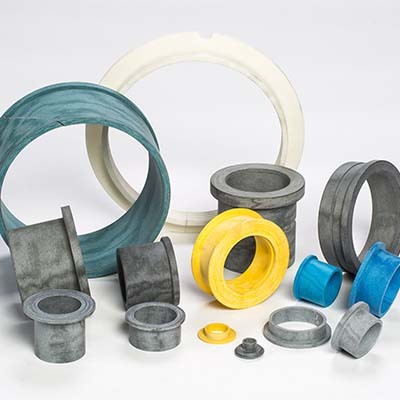 They can be produced from all of our range of material grades; additionally, they can also be self-lubricating with the incorporation of lubricants such as PTFE, Molybdenum and Graphite. 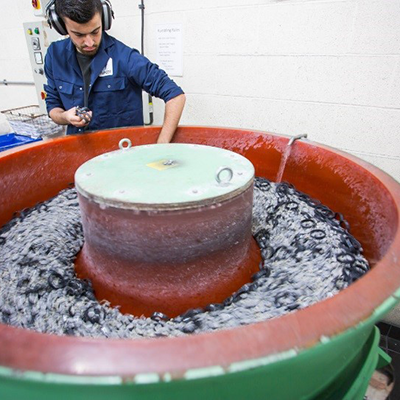 Wear pads can be drilled and grooved to customers’ specific requirements for the benefits of lubrication and fixing. 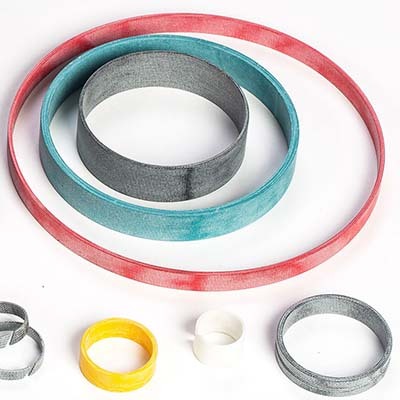 Tufcot wear rings of fabric composites are used in Hydraulic Cylinders which are subject to high loads such as can occur in mobile hydraulics and press construction. The high compressive strength, good sliding behavior and the exceptional wear-resistance properties ensure a long service life. We can produce customized components to suit our customers’ designs. These can all be produced from our range of material grades and from whichever product is most efficient or preferable (for example tube, rod or sheet). We can do a vast range of dimensions: our largest bearing was over 3.5 meters in diameter which was used for a Swing Bridge. 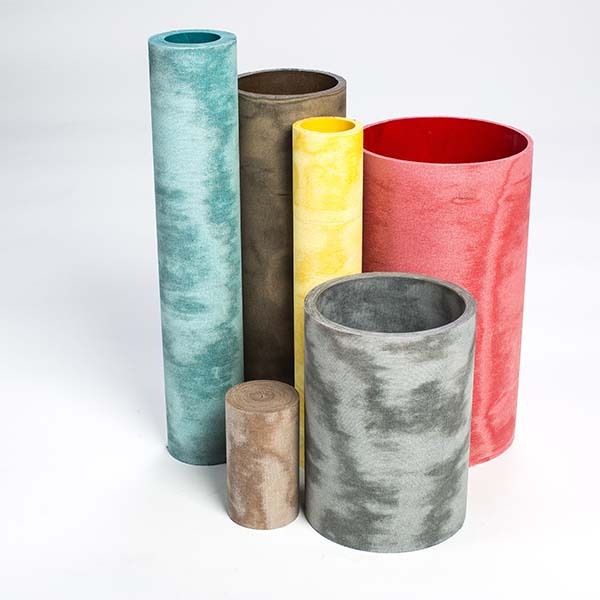 Semi-finished products are available in a variety of sizes and colors as required by the customer. Tube can be supplied in either thin wall or thick wall, offering the customer easier and more cost-effective machining, saving both time and money in machine operating costs. 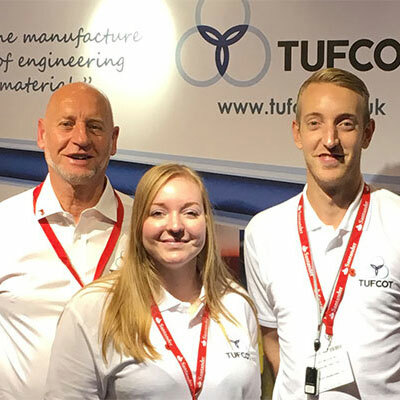 Tufcot produces raw material tubes, laminates and rods for customers who wish to reduce their delivery times and do the machining either in-house or via an external contractor. Delivery on tubes, laminates and rods (depending on sizes and quantity) is very short, to allow the customer to keep stock material or give their customer a quick turnaround. 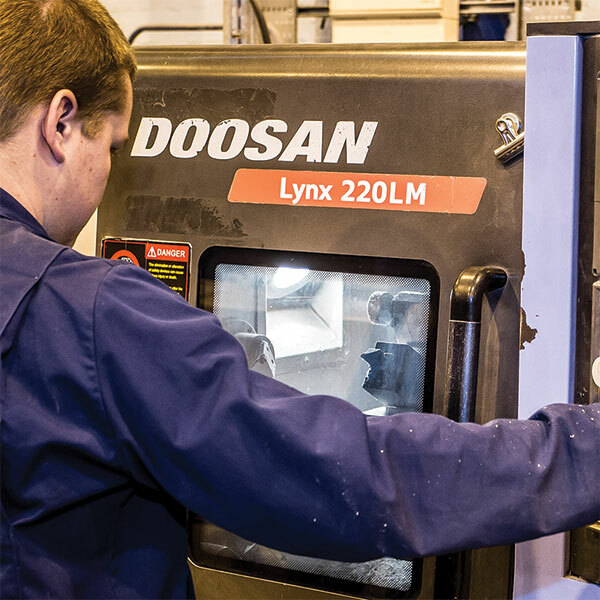 We have a full range of machining services available including Milling, Turning, Boring, Drilling and Finishing. This ensures that any size, shape and application can be designed and manufactured to the client’s exacting standards. Most sizes can be handled by our works: for exceptional sizes, contact our sales department. We also produce sphericals on CNC machinery. Special components can be manufactured to the customer’s drawings from all grades of Tufcot. In addition to special wear pads, bearings and bushings, plain spherical bearings can be manufactured in Tufcot to solve misalignment problems. Spherical bearings, combining metallic and Tufcot materials, can also be produced. For those applications where a fire risk exists, Tufcot can be produced with exceptional fire-retardant properties.